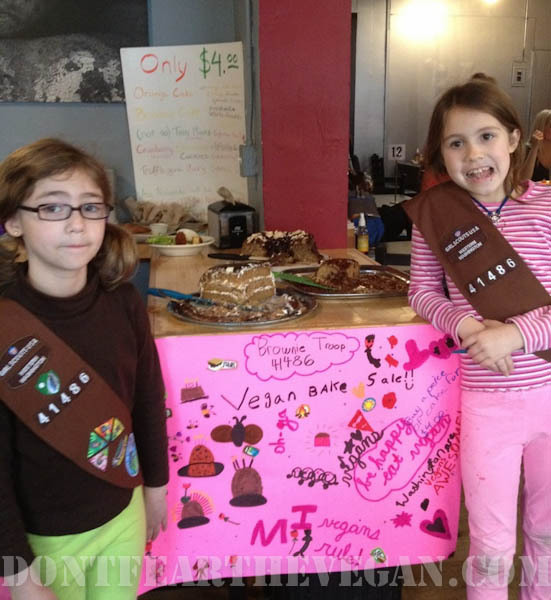 As you may have heard we are hosting two vegan Girl Scout bake sales. You can read more about them here. Last year I only made cakes and I wanted to switch it up this year. I also wanted to have something available for those with allergies to enjoy. For some reason I thought this would be the cookie to do it with and I was right, it came out amazing, and it is not just me who thinks so. Literally, as I sit here typing this I have been getting text from the sale telling me how awesome they are. They aren’t just good for gluten-free, they could stand up to any cookie! We will need to double the amount of these for the sale on March 2nd! Baking gluten-free stresses me out. Not just because it is a completely different science, which in itself is pretty scary, but I really worry about cross contamination. Having a daughter with a severe dairy allergy, we can always tell when someone didn’t clean their pan well enough and there has been a trace of butter left behind, because under her eyes turns a weird shade of purple, with a few other side effects that I won’t mention here. So needless to say, when I am cooking for people who I know are gluten intolerant I take every possible precaution. The easiest way to do this is to prepare everything on parchment paper and make sure you don’t have any glutenous products open in the area. Isabel and Anzia with the awesome sign their troop created! I created this recipe so that my daughter could help raise money for her troop and NARN. Last year, people that couldn’t make it to the sale or were simply interested in helping the cause asked me if they could donate, so I thought I would mention it this year. If you like this recipe, the cause or both and have a couple bucks to spare, you could donate to the cause via paypal at donfelipe2@yahoo.com. Any money raised will be split between the troop and NARN. *The chocolate wafers were delicious without the chocolate. If you simply are craving a chocolate mint flavor you could easily save yourself the trouble of dipping and eat them naked. *Everything tasted great, but I would like to play with the chocolate a little more. It came out a little too soft for my liking. But hey, I used to prefer my thin mints frozen! *I do not have a microwave. If you do, I am sure there is an easier way to melt chocolate. If you attempt it in the microwave I would love to hear how you did it. I use a glass temperature safe bowl over a pot of boiling water. A double broiler will also work if you have one. *If you opt to dip, you will need room in your freezer to freeze the cookies after dipping to harden the chocolate. *I used a glass with a 2″ diameter to cut the cookies which yielded 60 cookies. *Store in sealed container in fridge or freezer. *The second time I made these we used just melted chocolate for the dipping. My dippers said it was more difficult to work with the straight chocolate, but it hardened faster and stayed hard once on the cookie. There wasn’t a taste difference. I wasn’t there for the straight chocolate dipping so I didn’t get a measurement. Work fast. Chocolate hardens in the bowl faster. Make sure cookie is fully supported by fork, because it broke easier in the heavier chocolate. Mix chia seeds with 3 tbsp water and set aside. Melt chocolate (see methods in notes above) with 1 tbsp water. Once melted stir in peppermint extract. Remove from heat and set aside to cool. In a large bowl mix together flour, xanthan gum, cocoa powder, baking soda and salt. Create a well in the center and set aside. Once chocolate has cooled slightly, stir in brown sugar, olive oil and chia seeds. Pour this mix into the well in the flour mixture and blend well. Place half the dough between 2 sheets of parchment paper and roll out so it is 1/8″ thick. Cut circles or other shapes with your object of choice. Place on parchment paper a half-inch apart. Continue this process until you have used all dough. Bake for 10 minutes. Let cool for 5 minutes. Transfer to cooling rack and allow to cool completely before dipping. See notes above for melting options. Melt chocolate and water together. Once melted reduce heat and stir in cocoa powder, sugar and peppermint. Allow chocolate to cool for approximately 5 minutes. Have a cookie sheet or plate that can go into the freezer lined with parchment paper. For dipping we found it easiest to use a fork. Drop wafer in chocolate. Place a fork under the cookie to bring it out and allow excess to drip off. Place cookie on pan lined with paper. Once pan is full, place in freezer for 15 to 20 minutes to harden. Keep in cool dry place. We have a lot of moisture so I kept them in the fridge. Gallery | This entry was posted in Anzia's picks-a young vegans perspective, dessert, Gluten Free and tagged allergen free, chocolate, Girl Scouts, nut free, Thin mint cookies, vegan. Bookmark the permalink. I love the combo of chocolate and mint, so I can’t wait to try these. 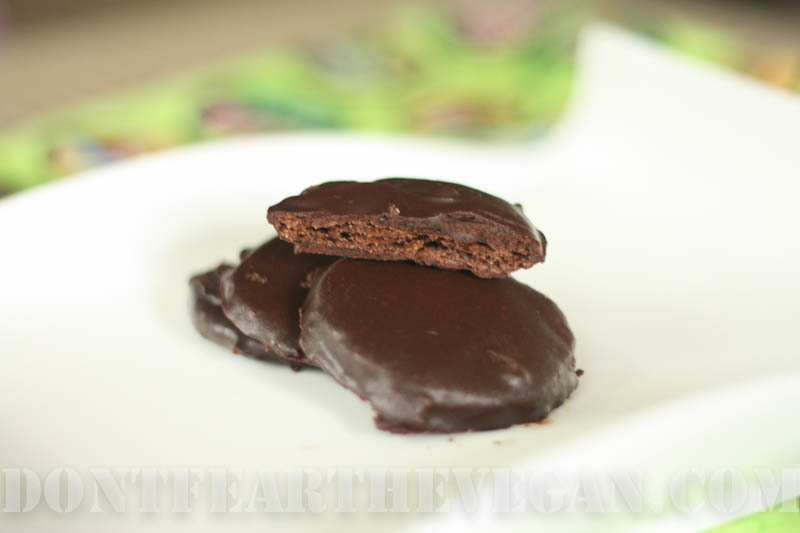 And my favorite gs cookies have always been the thin mints – in the freezer! I’m confused, though. I have heard that water can’t touch melting chocolate because it will make the chocolate grainy. I guess not, since you have the chocolate being melted with water. I was lucky enough to get to sample these, and they are definitely good competition for the GS original thin mints. These have an extra little crunch in them that I loved. Glad you liked them! Thanks for the feedback, and thank Isabel again for coming. Thanks for posting the recipe! We bought two bags on march 2 and thought they were great! My husband said, “You’ve GOT to find the recipe.” The recipe will hold us over until your next bake sale. The Samoa cake was also very good! Glad you enjoyed them. Thanks for the support and the feedback!